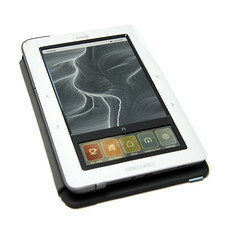 I got a Nook which is a Barnes & Nobel brand of an electronic reader. It is an early birthday present because I could not wait until next month to get it. I had to have it now because I am a book alcoholic and I did not want to buy paper books any more if I was going to get the Nook. So now I have it and I love it, it is perfect for me since it takes seconds to download books. It is touch screen and colorized. I got a free $50 gift card to buy ebooks because I bought it the week Best Buy was having a special. I have read a total of 4 books on my Nook so far and it is great! I also love the feature on it that allows you to keep the books that you have read but you can archive them so you don’t have to go through them to get a book in your library. The Nook holds a really good charge. Mine went a full week without having to be charged. Do you own a Nook or another electronic reader? What is your favorite feature and what books do you read? Share with me in the comments. I saw your blog button on your mom’s site. Hope you don’t mind me tagging along for your journey. How do you like the Nook? Was wondering if Nooks or the Kindle were worth it?